The Summer Meals Food Safety Kit is an essential tool to help keep the food we provide children at sites as safe as possible. Summer meal programs, including the Summer Food Service Program (SFSP) and the Seamless Summer Option within the NSLP, present the opportunity to help alleviate summertime food insecurity and positively impact children’s growth and development by offering nutritious meals and encouraging children to develop healthy habits at a young age. 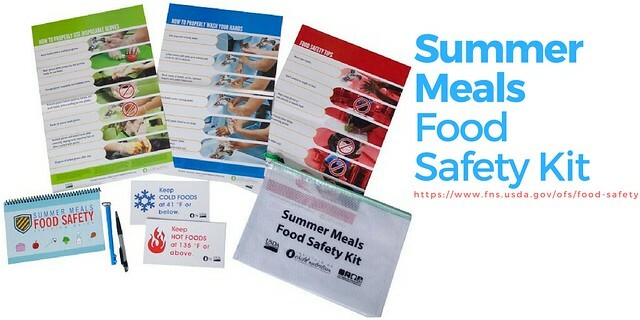 USDA, the Center for Food Safety in Child Nutrition Programs, and the Institute of Child Nutrition, will provide the Summer Meals Food Safety Kit to site operators as an essential tool to help ensure the safety of summer meals. FNS’s Office of Food Safety created the kit to promote and support food safety practices. The resource focuses on practicing good personal hygiene, as well as checking and documenting food temperatures. It also details proper cleaning and sanitizing of equipment and utensils, while emphasizing the importance of proper handwashing. The kits have also been designed with resources specific to the program location since sites can be hosted at schools, community and recreation centers, parks, churches or any other area where a need has been identified. FNS has provided states with more than 23,000 kits to date. Upon request, kits have been provided to state agencies for distribution to SFSP sponsors, prompting one state agency official to share, “I just wanted to say I really appreciated having these kits as a resource for my sponsors.” SFSP food safety kits can be requested from your State Agency contacts. Summer Meal Programs ensure that low-income children continue to receive nutritious meals when school is not in session. This summer, USDA plans to serve roughly 3.8 million children each day at approved summer meals sites – all the more reason to focus on food safety. Yes please send me the Summer Meals Food Safety Kit. I have 3 schools that provide meals John Glenn High School, North Liberty Elementary and Walkerton Elementary. I am located at Walkerton Elementary. I would like to obtain ain a kit to assist our clinical and Nutritionist with the kis she sees in clinic f and their families with this aspect of their care. She don s alot of work trying to provide ideas for the families to provide affordable foods. I work at a State agency that has clinics for kids with Special Healthcare provider is Needs. I too would like a Summer Meals Food Safety Kit. We have just this year started a SFSP in our community and have had a great response thus far!!! Thanks for the support!!! I really like the summer program that is going to be here at my school , Harrah Elementary in harrah these kids need a place to have nutritious meals sometime they go without meals and I am glad they have these programs to come and have fun.and of course learn during the summer so they will keep up and do better in the next school year. Please send me 3 kids kits. Hello, I would like to receives for the under-served under represented students 3 local neighborhood. I would also like to receive a kit. Please send one Summer Meals Food Safety Kit. My name is Isabel Hernandez and I'm a family advocate from Child Start Inc in Napa, CA. I work at our North Vallejo Head Start Site. I receive email about your nutrition information. I received an email about your "Summer Meal Food Safety Kits" and wanted to see how I can receive kits for my low-income parents I serve. @To readers: SFSP food safety kits can be requested from your State Agency. State agency contact information can be found here: www.fns.usda.gov/sfsp/sfsp-contacts. @deana wray: SFSP food safety kits can be requested from your State Agency. State agency contact information can be found here: www.fns.usda.gov/sfsp/sfsp-contacts. We would love to get 15 kits if possible! I would love to give these out at our training in a few weeks to each open site! @BROOKE GARABEDIAN: SFSP food safety kits can be requested from your State Agency. State agency contact information can be found here: www.fns.usda.gov/sfsp/sfsp-contacts. the summer program I'm sure it would be very helpful! @Beth Harris: SFSP food safety kits can be requested from your State Agency. State agency contact information can be found here: www.fns.usda.gov/sfsp/sfsp-contacts. Thank you for continuing Summer Meal Programs. We have lots of readers of our blog (http://igeorgiafoodstamps.com/) who have children that participate in the program and have found it to be of great help in relieving some of the financial burden they face when kids are not in school and therefore unable to have access to the school lunch program.